One of my friends works for a local news affiliate and posted on her work page an article about a new “real barbie” coming out. It sparked some talk about the lack of imagination in children today and how technology plays a big part in that. Well, it’s funny that I felt the need to chime in because I’ve had the title of this post sitting in my draft box for the last week. So, nows a better time than ever to sit down and put my thoughts out there. Yes, Henry has a Kindle and yes, I know people judge me for “spoiling” my one year old with a piece of technology that he doesn’t know how to work. False, he does know how to work it and he’s pretty dang good at it too. Before you get all judgy judgy on me for sticking a piece of technology in my sons hands instead of interacting with him, let me lay my point of view out there. I went on to work at Washington in that environment for 3 years, I became the assistant to our technology person, helped roll out the 1:1 iPad program and am beyond proud of the things I learned while working there. Now, I’ve helped propose bringing a 1:1 program to one of the schools I’m working at. You see, technology in the hands of children is what you make of it. Kids don’t learn to read just by picking up a book. Technology doesn’t limit creativity, but it helps enhance it. I’ve been blessed to work amongst AMAZING teachers, teachers that I’d kill to be, and the things they’ve done is mind blowing. They’re still teaching, but they’re doing so much more than that. Eyes have been opening, ideas have been put to work and great pieces have been created. There are even teachers who don’t even want to use technology because it goes against what they’ve taught for years. Schools aren’t just puddles of technology. If someone finds one, can you please point me there?I’d love to work at it! I’ve also seen teachers abuse the technology and I’ve also seen teachers abuse textbooks. A crutch, not a tool. One person commented on the thread this morning that her child is on an iPad 4 hours a day at school. Are you kidding me? That’s ridiculous. Not even I, who forces technology down peoples throats, think that’s right. Someone else brought up that recent college graduates won’t know how to teach because there’s an app for that. From my experience in college and working with recent college graduates, they don’t get to dabble in as much technology for teaching as others think. It’s because each district is different with their technologies. A lot of teachers will learn Web 2.0 and have sessions on technology, but that’s not all college is. New teachers still have fresh new ideas and may find a way to use technology along the way, but is it wrong to help reinforce a topic my using an app? People will continue to argue that teachers aren’t doing their jobs and the technology is. I urge those people to step into the rooms of teachers and see what’s really going on. It will amaze you. Technology is here to stay, it’s not going anywhere. We should embrace it in our education system. I still use paper and pencils for lots of things in my classrooms because I find it important. If I taught math, I’d certainly teach them how to do it with a paper and pencil before ever giving the students technology. Sometimes I get irritated when I see collages hanging up in the hall, but then I think, awesome people still use magazines, glue and scissors. Flipping gears, when I brought to Ben’s attention that I wanted Henry to have a mobile device he looked at me funny. I know our one year old (he was 10 months when he got it) doesn’t need it, but I wanted him to have it for no reason other than I think it’s a great learning tool. Originally we settled on an iPad mini, but thanks to an awesome Black Thursday sale at Best Buy, we went with the Kindle. Guess what, Henry uses it and I love it. It’s loaded with tons of free apps from Fisher Price and free ebooks. He LOVES the sounds, colors, and interaction. He LOVES books. He’s getting something from using his Kindle, his books are coming to life. We didn’t teach him what the duck says, he learned it from his ABC app. Did we teach him what the cow and horse say, absolutely? We maybe pull out the Kindle once a week and usually it’s me on Mondays when Ben is gone and I’m trying to cook dinner while making sure Henry doesn’t get into anything. 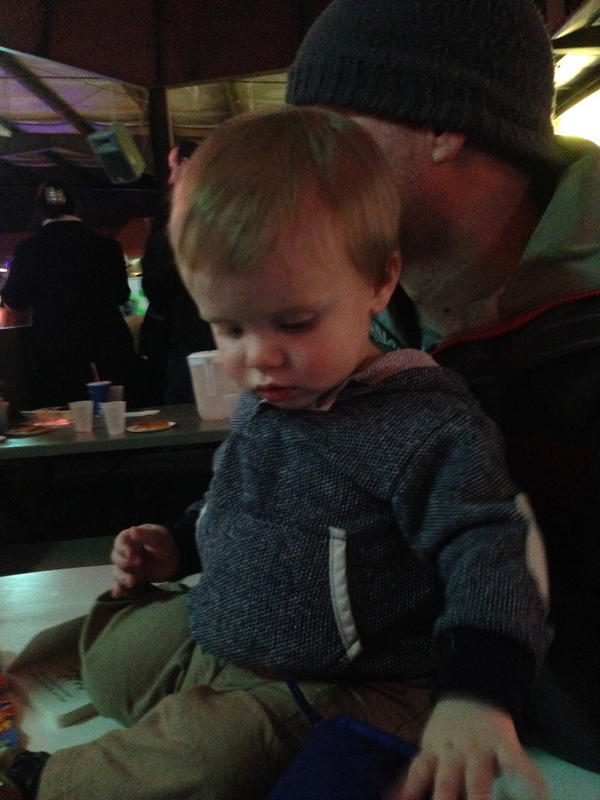 So, after I’ve plopped him in his highchair, I’ll break it out turn on the ABCs and we’ll go through things together. 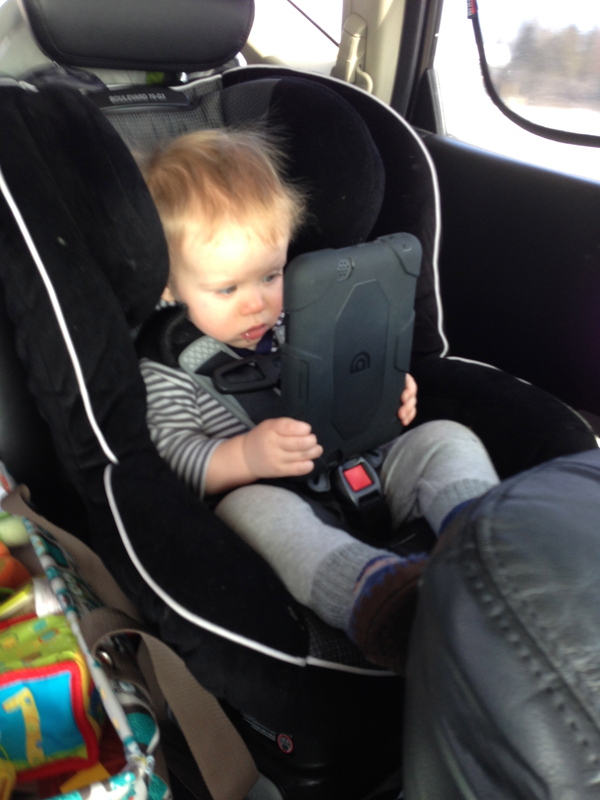 I’m not using technology to babysit my child (well except when we were road tripping this last weekend and he’d had enough of the car. The Kindle was the only thing that kept him quiet). We’re learning together. He’s not dependent on his device to function. He still plays with his toys all night long and has showed us he has quite the imagination. He knows where it’s stored and never has he sat screaming at the drawer waiting for me to pull it out. Every night he gets read too and spends more time playing with books than any child I’ve EVER met. You see, technology in moderation is fine in my opinion. It’s how you use it and approach the tool that matters. We don’t bring it in public to restaurants with us. At the grocery store he’s far too busy looking around (or trying to climb out of the cart) while we talk about different foods to even care about my phone with the grocery list on it. Heck, he still loves my phone as a chew toy (and taking selfies of course). Personally, I see where people think that technology is taking away the creativity and imagination of kids. I’ve found, professionally and as a parent, if you are using it correctly, it only enhances their learning and imagination. Henry won’t be allowed, as he gets older, to use his Kindle when he wants. (The best part about the Kindle is the parental controls and the ability to turn off after certain periods). He’ll still be outside finding adventure and hopefully loving books as much as he does now. We won’t allow game consoles in our house and he sure as hell won’t watch SpongeBob. Before you judge teachers, schools and parents for giving todays children, 21st Century learners, a piece of technology, look at the approach. Yes, I’ve seen parents use technology and TV to babysit their kids (I’ve even done it while trying to mop the floors on a Saturday morning), but there really are parents and teachers who find great ways to use it with their children. In the end, people do what works for them. Sometimes we need an electronic babysitter so we can breathe for a few minutes! It’ll be a never ending debate as people will continue to abuse the tools in schools and at home, but the drinking age, smoking age, when kids should be allowed to drive and numerous other things have continually been a debate for my 26 years of life. Society feeds off politics and debates, lets just add technology use to that list.